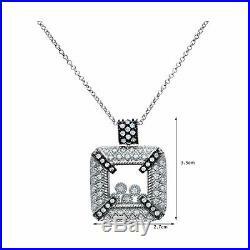 Citerna Women&###x27;s Sterling Silver Cubic Zirconia Floating Stones Square Pendant Necklace of Length 46 cm. Item model number: SNK1300 E. Total Metal Weight: 13 Grams. Elegantly crafted in gold plated silver for a warm and classic tone. Set with cubic zirconia, a synthetic stone with a flawless look and colour. Citerna boasts classic gold and silver jewellery that is both versatile and timeless. 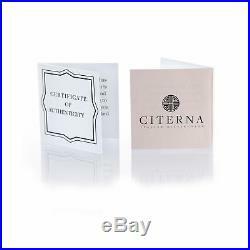 Presented in a Citerna branded gift box. 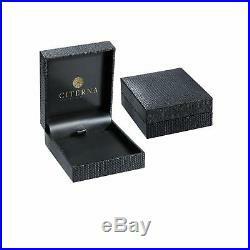 All Citerna products include a certificate of authenticity and are hallmarked according to UK law. Inspired by sparkling drops of water in a waterfall, the freely moving Cz stones held between two glass shields on this square shaped pendant create a cascade of sparkling light to the Pendant. The square chunky Pendant has a thick woven design and is filled with Cz stones giving the Pendant a cushion like heavy feel. With the addition of the Black Rhodium plated corners they add precise amount of colour and class to this pendant. Stones include: Cubic Zirconia Metals: Black Rhodium plated; Sterling Silver Length of chain 46cm, length of Pendant 3.5cm Chain features an easy open/close bolt ring fastener Each product comes packaged in a branded box and gift bag Box Contains NecklaceTrace chainElegano gift boxElegano present bag. 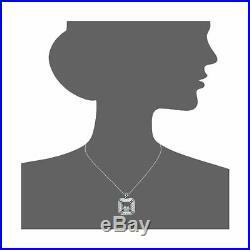 The item "Citerna Women's Sterling Silver Cubic Zirconia Floating Stones Square Pendant" is in sale since Wednesday, July 25, 2018. This item is in the category "Jewellery & Watches\Costume Jewellery\Necklaces & Pendants". The seller is "ssb-direct" and is located in GB. This item can be shipped to United Kingdom, Austria, Belgium, Bulgaria, Croatia, Cyprus, Czech republic, Denmark, Estonia, Finland, France, Germany, Greece, Hungary, Ireland, Italy, Latvia, Lithuania, Luxembourg, Malta, Netherlands, Poland, Portugal, Romania, Slovakia, Slovenia, Spain, Sweden, Australia, United States, Canada, Brazil, Japan, New Zealand, China, Israel, Hong Kong, Norway, Indonesia, Malaysia, Mexico, Singapore, South Korea, Taiwan, Thailand, Chile.